After experiencing the seemingly never-ending winter that recently passed, today reaffirmed how great nature can be and how lucky we are who study, appreciate and revere it. The editor apologizes for not listing more but it is the month of May with bushels of bird reports and the hour is late. Summer Tanager is a rare visitor indeed to Somerset, Morris and most counties in New Jersey. This immature male was observed by Jeff Ellerbusch, Grant Price and Bob Roland in the Chimney Rock parking lot. 8 species of warblers were also in attendance as May starts to heat up. What has become an unprecedented spring for Yellow-throated Warblers in the mocosocoBirds region adds another record today. Jim Mulvey found and photographed a Yellow-throated Warbler (Setophaga dominca albilora) by the Kitchell Pond bridge on the main path at Loantaka Brook Reservation. The warbler was still present at the same location at 5 p.m. Numerous other warblers and vireos were reported by many observers today from Loantaka. Jim Gilbert found the Vesper Sparrow pictured above along the drive leading from Lees Hill Road to the Fenske Vistor Center. It was still there at 6:00 p.m. Pleasant Plains Road is flooded and impassable beyond the Fenske Center but the water has also created favorable shorebird habitat. The following shorebirds were seen near the water’s edge: 1 Spotted and 2 Solitary Sandpipers, 2 Greater Yellowlegs and 2 Least Sandpipers (J. Klizas, Simon Lane, Joe Pescatore). Modest, of course, but this is Morris County where every shorebird is savored; one cannot be sure when one will be seen again. Jonathan’s Woods is more than the late Cathedral Pines, mostly destroyed by superstorm Sandy in 2012. There is an extensive wetlands system, deciduous woodland and mixed habitat which is a magnet for migrant songbirds in spring. At dawn today were Great Crested Flycatcher, Warbling Vireo, Veery, Hermit Thrush, Ovenbirds, Northern Waterthrush, Blue-winged Warbler, Common Yellowthroat, Hooded Warbler, Yellow, Palm, Pine, Yellow-rumped and Black-throated Green Warblers and Baltimore Oriole. White-throated Sparrows were numerous. Snakehill Road: a flyover Osprey, Blue-headed Vireo, 3 Wood Thrush, 1 Brown Thrasher, 4 Ovenbirds, 2 Louisiana Watherthrushes and 1 Black-throated Green Warbler. Lake Denmark Road: flyover Common Loon, Broad-winged Hawk, Killdeer, Spotted Sandpiper, Yellow-throated Vireo, Gray Catbird, Ovenbirds galore , 2 Louisiana Waterthrushes, Blue-winged Warbler, Black-and-white Warbler, American Redstart, Yellow-rumped Warbler, Prairie Warbler, Black-throated Green Warbler and Baltimore Oriole. A Common Raven harrased a Red-tailed Hawk over Green Pond Road at Craigmeur. Deerhaven Lake. adds a visual Worm-eating Warbler and Blue-headed Vireo. Oak Meadows/Sasso Tract and the Righter Mine Trail had Veerys, Red-eyed Vireo, Ruby-crowned Kinglet, Great Crested Flycatcher, Louisiana Waterthrush, Ovenbirds, Black-throated Green Warbler, etc. The Common Terns of yesterday are gone but 4 basic plumaged Bonaparte’s Gulls remain along with hundreds of swallows and 2 Common Loons at Budd Lake. White-eyed Vireo at 6pm at Robert Stahl Natural Area, Bedminster. Also 3 Green Herons, and a Savannah Sparrow. Gray Catbird, Black-and-white Warbler and Blue-headed Vireo. Hardscrabble Rd, Bernardsville: Black-throated Blue Warbler. Continuing Eastern Meadowlarks singing in the fields at Black River & Lamington Roads. 1 Black-crowned Night-Heron on the Somerset side of the Green Brook Park opposite the Horse Shoe Pond – first time I’ve seen one there. It was kind of dirty looking on the belly area; mud, I guess. There was also 1 Green Heron in a tree by the same pond (Union side). 2 Black-crowned Night-Herons at West End Pond, on tree limbs in the back. 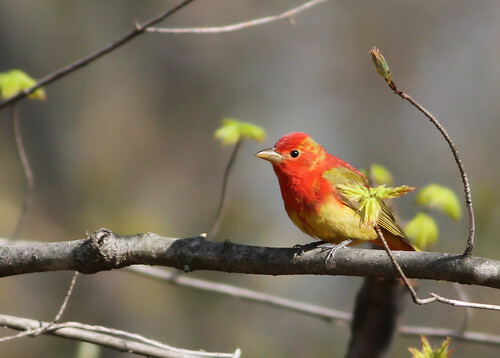 This entry was posted in Morris County, Somerset County and tagged birding, birds, Chimney Rock, migration, mocosocobirds, Morris County, nature, ornithology, somerset county, Summer Tanager, Warblers, Yellow-throated Warbler. Bookmark the permalink.